Many of the tens of thousands of civilians who have fled their homes following a string of deadly attacks by “terrorist group” Boko Haram in northern Nigeria over recent weeks have not yet been able to return home - or been offered any shelter by the authorities. Local government authorities are wary of setting up camps for the displaced, says the Nigerian Emergency Management Agency (NEMA), as these could turn into further Boko Haram targets. The number of displaced is unclear, say aid agency representatives in Nigeria, as Boko Haram attacks are continuing. The largest estimated displacement was 90,000 people who were reported to have fled Damaturu city in Yobe State following deadly attacks in late December, said Ibrahim Farinloye, northeastern Nigeria coordinator for NEMA. According to the Nigerian Red Cross, members of the Christian Igbo ethnic group - a minority in the mainly Muslim north - are fleeing the northeast in significant numbers. Some 10,000 people are reported to have been displaced in the southern state of Benin on 9 January following what are believed to be retaliation attacks on mostly-Muslim Hausa residents, according to the Internal Displacement Monitoring Centre of the Norwegian Refugee Council. Many displaced families told IRIN they were wary of returning home both because of further Boko Haram attacks, and because of what they say is heavy-handed military tactics used by soldiers patrolling their neighbourhoods. Babagana Ari fled the Pompomari neighbourhood of Damaturu city in Yobe State in late December following attacks and ensuing violence which reportedly killed over 60 people. He, his wife and six children are staying with his brother in a two-room house in another part of the city (Bakin Kasuwa). "Some residents who went back to pick some belongings in their homes never came back, and the assumption is that they were shot dead by soldiers who took them for Boko Haram members," he said. Another displaced person, Yahaya Masu’ud, voiced similar fears: "I don't know when I can return to my home, especially with the state of emergency that has been imposed on the city by the president... This has conferred enormous power on soldiers." Hundreds of soldiers have been deployed to patrol the streets of Damaturu, Maiduguri, the capital Abuja, and other cities. Several security specialists have urged the government to take a more considered approach to quelling the power of Boko Haram - through stronger intelligence-gathering and in some cases, more proactively engaging with the group - as they say a strong-armed military approach will merely lead to more violence. A state of emergency has been declared in Yobe, Borno and Plateau states, while curfews have been imposed in Adamawa State, according to the government. The state of emergency has also complicated returns as it entails imposing dusk-to-dawn curfews and a ban on motorcycle taxis, which is the principal means of transport between cities, said NEMA’s Ibrahim Farinloye. With the displaced remaining largely uncounted, and so spread out, aid groups find it difficult to reach them, said local NGO Actionaid head Abdu Hussaini. “People are not stationed in one place. Most are staying with extended families… We need a different way of responding to that,” he said, adding that keeping track of where people are headed is also difficult, and recommended closer monitoring of the situation. NEMA set up a relief committee in late December to coordinate distributions, and has asked international NGOs to help with basic materials, a call to which the International Committee of the Red Cross has responded. 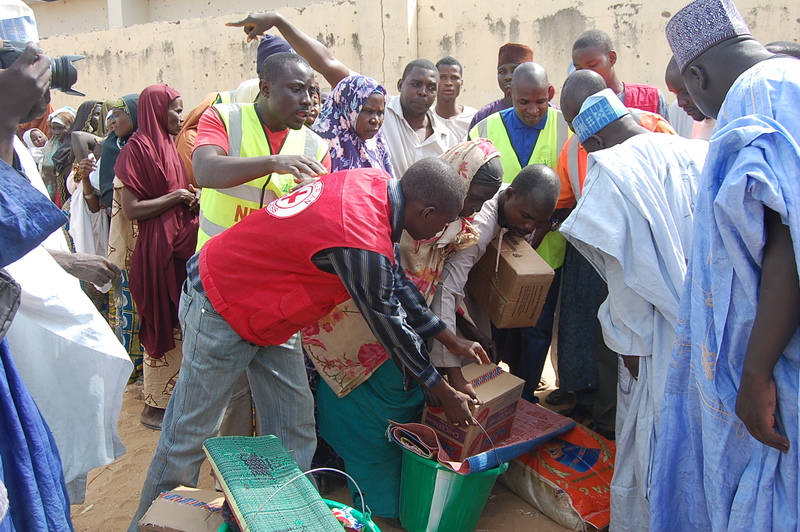 NEMA has reserved emergency supplies in warehouses across several states, said Farinloye, in case more aid is needed.